Port Douglas Retreat is only 3 minutes from the heart of Port Douglas Village. Here you can sample the delights of the restaurants, cafes, local markets and shops. Port Douglas is also regarded as a stepping stone to a wealth of natural wonders - the Great Barrier Reef, Daintree Rainforest and tranquil sandy beaches. 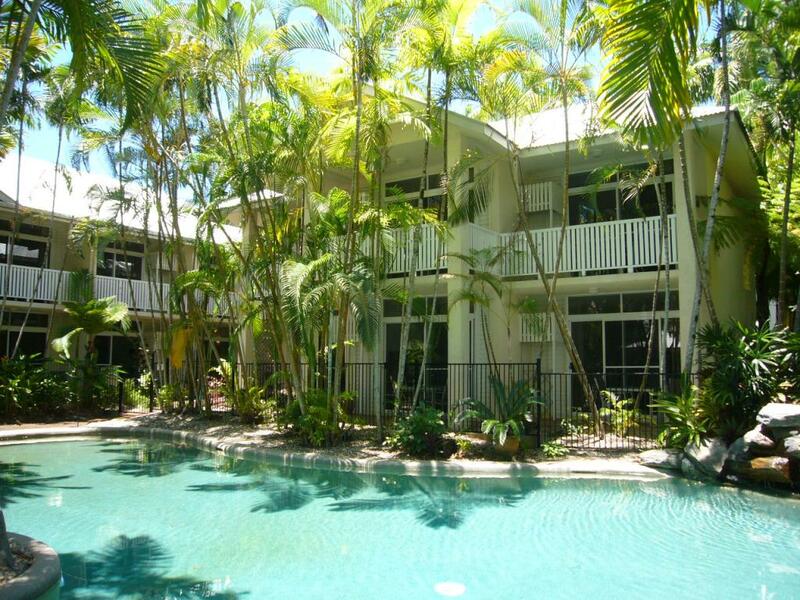 This Port Douglas accommodation offers self-contained air-conditioned studio units. The holiday apartments feature traditional north Queensland architecture with the extensive use of timber in the entrance, walkways and pool surrounds. Built on only two levels, the building blends in with the tropical gardens that attract many native birds. Facilities include a large saltwater pool and outdoor entertainment area with gazebo and barbecues. Conveniently situated in a central location, Port Douglas Retreat is also only a short stroll to beautiful 4 Mile Beach and The Reef Marina. This Port Douglas Resort is an ideal base for you and your family on your next North Queensland holiday. Port Douglas Retreat offers 36 self contained, air conditioned studio style units featuring private patios or balconies. Tree View Studio Apartment: Features Kitchenette facilities. Size is 36m². Bedding is 1 King Bed OR 2 Single Beds. Maximum room capacity is 3 Adults & Children. Pool View Studio Apartment: Features Kitchenette facilities. Size is 36m². Bedding is 1 King Bed OR 2 Single Beds. Maximum room capacity is 3 Adults & Children. From your accommodation at Port Douglas Retreat, you can access an array of restaurants, bars, cafes and shopping facilities that are just a short walk from the hotel. One of the most enjoyable parts of a Port Douglas holiday is exploring the award wining restaurants and cafes that serve a variety of cuisine, from beautiful North Queensland seafood to Australian contemporary menus or why not try both with an Asian influence. Breakfast, Lunch or Dinner, the selection in Port Douglas is yours - its all within walking distance and with a choice to suit all budgets. During peak season it is advisable to make a reservation.